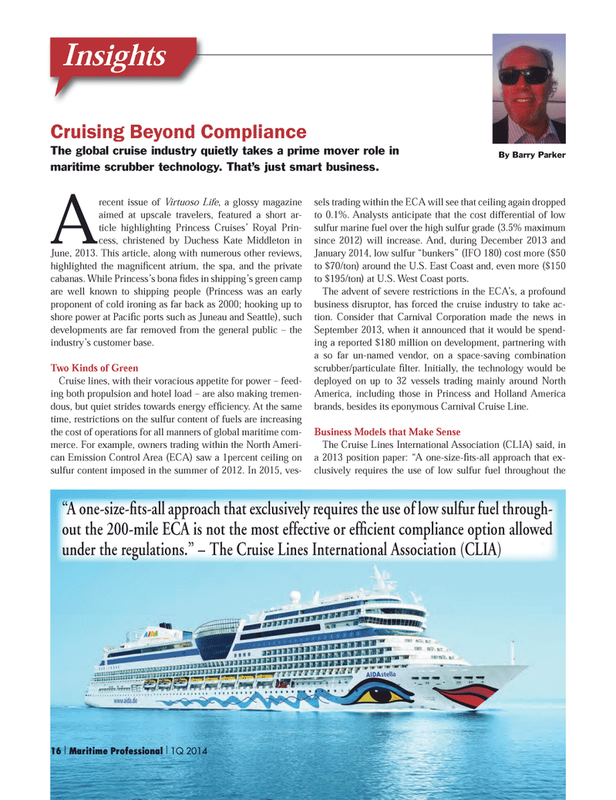 The global cruise industry quietly takes a prime mover role in maritime scrubber technology. That’s just smart business. June, 2013. This article, along with numerous other reviews, highlighted the magnifi cent atrium, the spa, and the private cabanas. While Princess’s bona fi des in shipping’s green camp are well known to shipping people (Princess was an early proponent of cold ironing as far back as 2000; hooking up to shore power at Pacifi c ports such as Juneau and Seattle), such developments are far removed from the general public – the industry’s customer base. January 2014, low sulfur “bunkers” (IFO 180) cost more ($50 to $70/ton) around the U.S. East Coast and, even more ($150 to $195/ton) at U.S. West Coast ports. America, including those in Princess and Holland America brands, besides its eponymous Carnival Cruise Line.